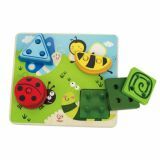 Multi-layered bugs encourage counting, sorting, and color identification. Count the pieces. Count the holes. Name the colors. 13 pieces. L: 20, W: 18, H: 4.2 inch. Age: 24+ Months. 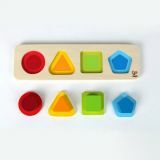 Four chunky pieces are perfectly sized for toddlers' hands. Count the pieces. Name the shapes. Name the colors. L: 28, W: 8, H: 2.5 inch. Age: 12+ Months. 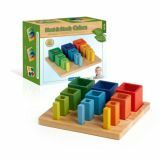 The unique design of this wooden manipulative allows for several exciting ways to play and learn. 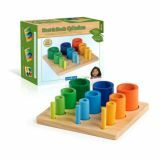 The brightly colored cylinders are graduated in size and nest together, inspiring exploration and promoting fine-motor and shape-recognition skills. 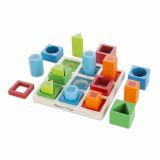 Also, each series of shapes feature colors that range from primary to pastel: as the pieces get smaller, the colors get lighter. Ages 2+. 8″L x 9″W x 3″H.